This three days package to the Dhampus and Sarangkot hill is short but a great rewarding trek. Walking through sparse human settlements, terrace farming and forests to reach Dhampus after few hours of walk. A fascinating view of a long range of mount Annapurna and other mountains greets us on reaching Dhampus. We enjoy the amazing sunsets on the Himalayas in the evening and sunrise next morning, a scenery that you will treasure for life. Next day we walk back the downhill through equally scenic route and catch a vehicle for Pokhara. 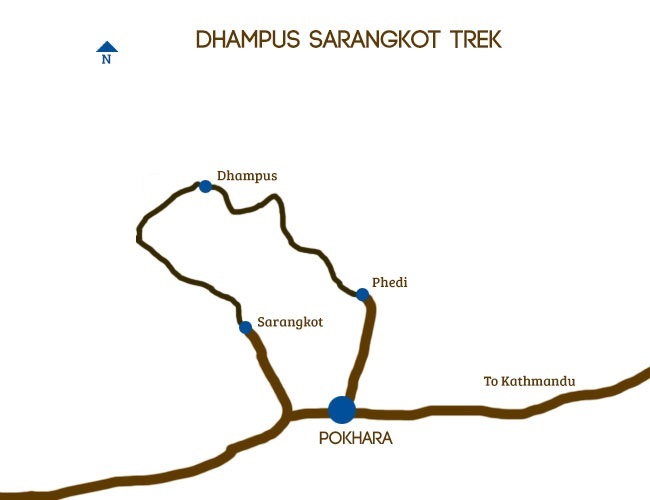 The major highlights of the Dhampus Sarangkot trek are an exploration of villages, witnessing panoramic scenes of the elevated Himalayan peaks- Lamjung Himalayan range, Mt. Machhapuchhre, Himchuli, Annapurna South, etc. Also, experiencing the picturesque drive along the Trishuli and Marsyangdi rivers, lush view of the countryside, Fewa lake, magnificent Annapurna mountain range, sunrise and sunset views, living style of Nepal countryside and local culture of Gurung people will be an unforgettable experience. In this 3 day Dhampus Sarangkot Trek designed by Luxury Holidays Nepal, you will be accommodating at Lodge and the best season to go for this trek is spring and autumn. After breakfast, drive to Phedi in a private vehicle for an hour and then begin your trek by ascending to Dhampus for 3 to 4 hours. On the way, you pass through beautiful terraced fields, hamlets, and lush forest. Today’s trek, you start after taking your breakfast. The trekking trail passes through paddy fields, magnificent hills, middle landscapes and showcases the beautiful view of the Himalayan ranges. You reach Sarangkot, one of the Nepal's best sunrise and sunset view point from where you can see a breathtaking view of Annapurna (8,091m. ), Dhaulagiri (8,167m. ), Ganesh Himal (7,446m. ), Manaslu (8,165m. ), Machhapuchhre (6,993m.) and others. In addition, you also see a nice view of Pokhara city. You head off to Sarangkot before the dawn to see a magnificent view of sunrise and from there, you trek downhill to Pokhara, the city of lakes. You will take 2 to 3 hours. In Pokhara, you will walk on the bank of the Phewa Lake. You will do boating, visit David fall, Mahendra cave and then go to a hotel. Overnight at hotel. Accommodation in Standard guest house/ Lodge in twin sharing bed and breakfast basis. Luxury Holidays Nepal provides you standard Teahouse/Lodge throughout the journey. Teahouse and lodge have the rooms with just the basics, normally with a bed, blanket and pillows. Some rooms have the electric lighting system and every teahouse/lodge has a capacious dining room and lounge. Your breakfast is included during trekking but not other meals. Travelers take their breakfast and dinner at the tea house where they stay and lunch is taken during the trail in the local lodge. There are two good options for having proper drinking water during the trek. You can bring water purification tablets or fill your bottle for a nominal fee from the recognized and regulated "pure water" stations along the trek. As the last alternative, you can also purchase bottled water at the lodges. Throughout the trip of Mountain Trekking, your luggage are carried and moved by the porters. You should carry the water bottle, sunscreen, camera, spare jacket, etc. Your main luggage will be your trekking bag and you can carry a small lockable bag which will provide safety. Luxury Holidays Nepal will offer you private luxury vehicle for Pokhara-Phedi. You can find the facility of electricity in most of the villages during your journey and some have solar power where you can get to re-charge your batteries. But we advise you to carry extra batteries or power bank. The most significant thing that makes this trek enjoyable and memorable is the skilled, experienced, courteous and helpful leader(s) and crew members. Our trip will be led by only the best and most professional leaders. All of Luxury Holidays leaders are carefully selected on the basis of their appropriate experience, leadership skills and personal aptitude. With an objective of sustaining local communities, Luxury Holidays only employ local staffs who have adequate knowledge about culture, ecosystem, flora, fauna, geography, and history of their local regions. Though often overlooked, it's no exaggeration to say the entire trekking and expedition industry in Nepal is built on the back of hard-working local porters. It is their tireless efforts carrying supplies, equipment and baggage that make journeying to these remote areas possible. Therefore, we are firmly committed to porter rights. We make sure that all our porters are well treated, well paid and we provide the level of shelter, clothing and footwear that these harsh environments demand. Porters who become sick are treated with the same care and attention as other team members and we have previously used helicopters - at our expense - to rescue porters from dangerous situations. We support the work of the International Porter Protection Group (IPPG), making our resources available to them to help improve the working conditions of the porters. The expense of your journey, all the meals included in the package. Other costs may include souvenirs, drinks and snacks, tips and hot showers. Hot shower is available only in some place. Your tips are enjoyed by your supporting members of the group after the trip. If you like the service provided to you, we advise you to distribute 10-15% of your total cost as a tip to porters and travelling guide. Luxury Holidays don’t require a minimum and maximum size of the group for any Trek in Nepal. If travelers like to travel in Nepal with friends, families, colleagues are welcome to choose any tour packages at your convenient time frame. We will be happy to organize a small group like minded people to give them an unforgettable experience and opportunity to interact with each other in a fun-filled environment. Generally, there will be several separate groups. Each group will have a maximum of 15 people with its own experienced English speaking guide and there will be a suitable number of porters to carry luggage. Every morning after breakfast you will go on the day's walk of approx. 3-4 hrs. After that there you will be having lunch around midday. The day’s walk is shorter than morning's walk and you will reach your destination at the afternoon tea time. And the rest of the day you can enjoy travelling around the local place. Sometimes you can have the whole afternoon free. At night time you can play cards and release the tiredness of days. We meet and greet you at the airport. In airport when you pass the customs you can see our member standing with your name in signboard with our company's name (Luxury Holidays Nepal). After that, our member will greet you as well as locate you to your hotel that you are staying. Orientation will be at the Kathmandu hotel after your arrival and in the evening there will be a welcome dinner with cultural program. The orientation meeting is scheduled for an evening on the first day of the tour. Generally, the orientation meeting will be at 5 or 6 pm and this will be informed by our representatives after your arrival. The itinerary may change during the journey, according to the conditions of the current situation. So, the trip can be modified a little by discussing the guide. But the timeline for completion of the trip will be same. You will be travelling the remote areas of Nepal, so some unexpected event can occur and in such situation, the itinerary is changed. In such conditions, your travelling guide will suggest you the best way. The duration of the journey will exactly according the itinerary, but it can be shorted as per the wish of the client. The money is not refunded if you make your journey shorter. You may have to pay extra money for the service provided in Kathmandu in some cases otherwise not. Some major currencies (USD, AUD, and EURO) are accepted for both visa and in general. There are plenty of ATM's in both Kathmandu and credit cards are accepted in limited shops and many restaurants. Please note that only Nepali rupees are accepted on the trek. If you want to see a close view of Mt. Everest and Himalayan peaks, we can arrange mountain flights. You can contact luxuryholidaysnepal@gmail.com to book. To know more about Everest Scenic Flight, please click here. The magnificent environments of Himalayas are also intensely delicate. More number of trekkers have intimidated the magnificence of Nepal. But we, Luxury Holidays Nepal is immensely concerned to protect the environment and to lessen the consequences of high population. We do not inspire to use wood and campfire. We request to be eco-friendly. We also request you to keep your trekking site clean and enjoy your traveling. If you like our service and you want to extend your trip, then we can further organize your trip to India, Bhutan and Tibet. And other trekking and activities of Nepal like Everest Trek, Annapurna Trek, Manaslu Trek, Langtang Trek, Bunjee Jumping, Rafting, Peak Climbing, Tours, etc.